Explore the entertaining world of Crinoline in this beautifully produced hardback book with lenticular cover featuring an array of 3-D images and packaged in a slipcase which includes an OWL viewer. PLUS an exclusive bookplate hand signed by the authors. Published to coincide with the V&A's highly anticipated exhibition, "Undressed: A Brief History of Underwear". "A very special and wonderful book with enlightened research unveiling fascinating facts such as crinolines being considered an extremely dangerous form of clothing at one time. 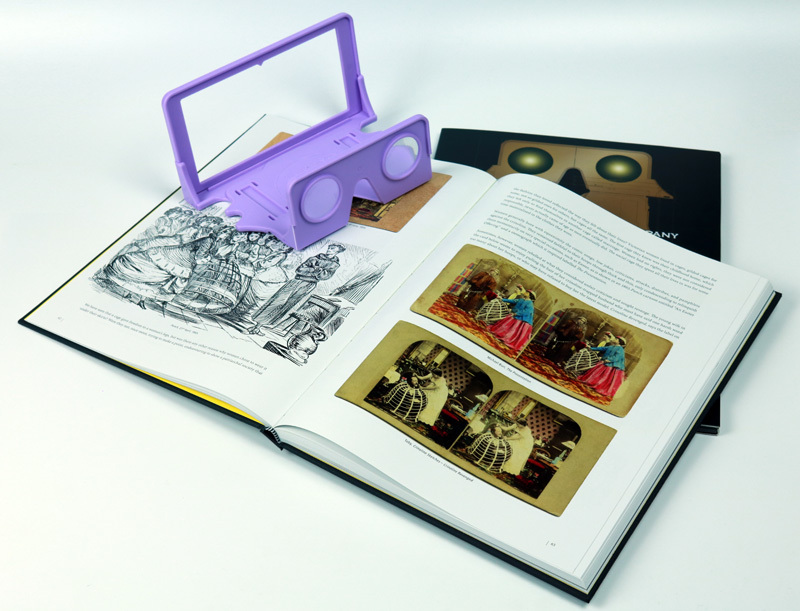 Great examples of 3-D pictures totally in keeping with its historical importance, complete with 3-D viewer." "Crinolines and Stereoscopic photographs were twin sensations of the mid 19th century. We, the authors of this book, decided it was fitting that they should be reunited in the 21st century, and their intimate association recognised at last. This book explores the history of crinoline 'in depth'. It's also an attempt to fathom the unique appeal of this dangerous fashion, which, surprisingly, is alive and well in the present day, and its place in popular culture." The voluminous crinoline underskirt was immensely popular between the years of 1856 to 1867, but was by its very nature severely impractical: a strong gust of wind would blow the dress up exposing the woman's legs and undergarments; worse still, the crinolines were cumbersome, caused accidents and proved to be a serious fire hazard. As the shapes of crinoline garments grew more and more extreme, artists were inspired to capture the absurdities and misfortunes of the wearers through stereo photos, as well as in cartoons and drawings. 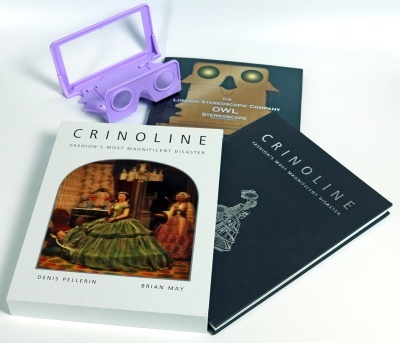 Just as Crinoline came into fashion, the stereoscope – the equivalent of TV and Film for the Victorians – became a huge craze. Stereo photographers capitalized on the ridiculous spectacle of the women in crinolines, giving impoverished Victorian husbands some consolation in laughter. Although the hoops and inflatable frames disappeared, this wonderful humorous imagery produced during the Crinoline decade has lasted intact over the centuries – and is rediscovered in this book. 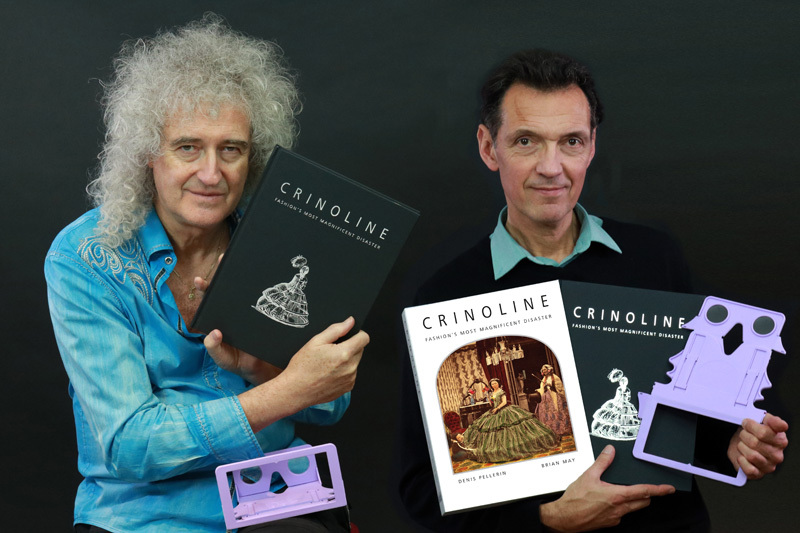 Crinoline – the book – begins with the emergence of the steel petticoat and the initial onset of the "Crinoline Age", and then takes the reader on a fascinating visual journey, including a wealth of colourful 3-D imagery, to the historical moment when women began to protest against the "cage" and it was eventually phased out. However, contemporary designers such as the late Alexander McQueen, Zandra Rhodes and Vivienne Westwood have reintroduced the crinoline to the catwalk, bringing the dramatic garment of the 19th century all the way into the 21st century with a modern twist.